I joined the company right at the start and the opportunity to grow a business from scratch using the skills I had gained in my career was very appealing. For trainees and anyone new to recruitment: We have a very in depth and structured training programme delivered in house by our Training Manager. You are not thrown in the deep end with no training. Every trainee joins the team fully trained in all the areas required to work as a 360 degree recruitment consultant. The training doesn’t stop there. You will be supported with both internal and external training relative to your experience throughout your career at Avanti. Managers sit with the teams and are on hand to provide help and guidance to ensure you are fully supported to be the best recruiter you can be and achieve both career and personal objectives. As a more experienced consultant, you are treated like an adult at Avanti and supported to really maximise your potential. 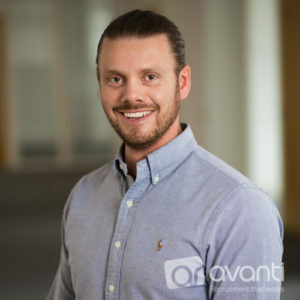 Avanti allow our experienced consultants to run their own desks and work with them to set strategy, process and objectives to maximise performance rather than dictate KPI’s and use a “one size fits all” approach. We understand that people work better when they feel valued and are allowed autonomy and freedom to excel. The company culture really is different to the majority of specialist recruitment business’s. You can expect a more relaxed environment, and a management team that values quality over quantity. Staff retention is high and the atmosphere is open and honest and has a family vibe. Career Opportunity: Every employee at Avanti knows exactly where they currently sit on the career structure and what they need to do to achieve their next promotion. This is reviewed regularly. The culture is meritocratic, meaning the best people are given opportunities in the company so there is no “glass ceiling” or “time served” and you do not have to wait for someone to leave to be considered for promotion.